Senior Gardener Willie Leaverette Jr. and his young gardeners remove the remains of the fall garden Tuesday morning. Mr. Leaverette is sharing 77 years of experience and wisdom with the youth of his church. Senior Gardener W. Leaverette of Mount Canaan Church and an army of adult volunteers are teaching the children of their church how to feed themselves and their families for life. 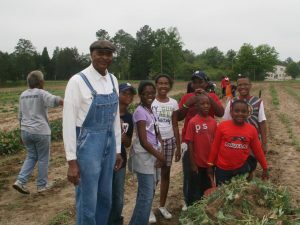 Deacon Calvin Cooks oversees the garden project and had the youth taking out the remains of the fall crop early Tuesday morning with plans to plant squash Thursday. The church funds the garden project for their Boys and Girls Club, made up of 5 year olds to 18 year olds, which currently has about 26 members. Fourteen of the youth were working in the garden Tuesday morning while out of school on their spring break. According to Deacon Cooks the children are mentored by the adults to lay in the plants and seeds, take care of the garden as the vegetables mature and harvest the crop when it matures. The produce that comes from the garden is first distributed to senior members of the church, then to other church members and finally to members of the community. It was reassuring to encounter young Mr. Michael Newton dressed in his Clemson University attire demonstrating proper plant removal techniques to his fellow Boys and Girls Club members.